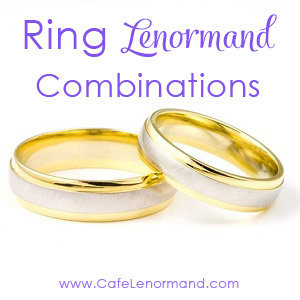 These Lenormand Ring combinations are meant to help you learn how to read Lenormand combinations. Please note that not every possible Lenormand Ring combination is on this list. As you learn Lenormand, you'll find that the total number of combinations is endless. Until then, use these Lenormand Ring combinations whenever you want to double-check your interpretations of a spread or need a helping hand in a reading. What do you think of these Lenormand Ring combinations? Let me know in the comments below. I'd love to hear from you! Thank you for your advise when I contacted you the other day. Could you please give me your thought about the cards? Situation: My friend is trying to contact her previous workplace because she wants to return to the office. She has not contacted the office yet so she does not know whether they accept her or not. Question: What would happen if she returns to her previous workplace? My interpretion is that she is able to return to the previous office, but she may feel an isolation at the previous workplace. Remember to read the cards in order from left to right. Here, the Tower is the first card in the spread, but your are reading the cards as if it were the last card in the spread. I am sometimes confused which meaning I should take, the meaning of the card itself or the combination. Could you please review the new interpretion? The job contract (ring) with the company (tower) will be happy one (clover), but my friend have to be quick (since clover is short term luck) to get the opportunity. As a conclusion, this is a good opportunity for my friend to return to the company. I think she can have the job at the company (tower + ring), can you tell that with this spread? This article can help you know when to look at the card itself or the combination: How to Read Lenormand 3 Card Spreads. It does look like she’ll get the job. It’s great if she can get the job because she is suffering from the current work environment. I am not sure about my reading, especially the clover card. I will read your article about the 3 card spreads again (I have read it a couple of times..) and other pages as well and get back for your feedback. Your reading is fine. The Clover adds a positive element to the spread and shows she should have a positive outcome.